Salad dressings. Ugh. We have more options to choose from than ever before, but very few of them are healthy. Have you looked at the ingredients lists on store-bought salad dressings? You might be thinking: yeah, I already know salad dressing is unhealthy because it’s high in fat. News Flash: It’s not the high-fat content of salad dressing that makes it bad. Quite the contrary! A salad dressing made with healthy, high quality oil is actually quite good for you. The problem is, none of the popular store-bought salad dressings are made with healthy oils and fats. Nearly all of them are made with soybean and/or canola oil. In fact, I challenge you to find even a single salad dressing at your local supermarket that is not made with these oils. Even the ones that claim to be made with extra virgin olive oil still have soybean and/or canola oil in them. So disappointing! What’s wrong with soybean and canola oil? They are highly processed, pro-inflammatory oils. That means they create inflammation in our bodies. Inflammation is linked to many diseases: everything from heart disease to diabetes to cancer to arthritis. Inflammation has also been linked to weight gain and inability to lose weight. Convinced you need to upgrade your salad dressing? I hope so! Here’s a dressing recipe that’s simple, delicious, gluten free, soy free, and dairy free! 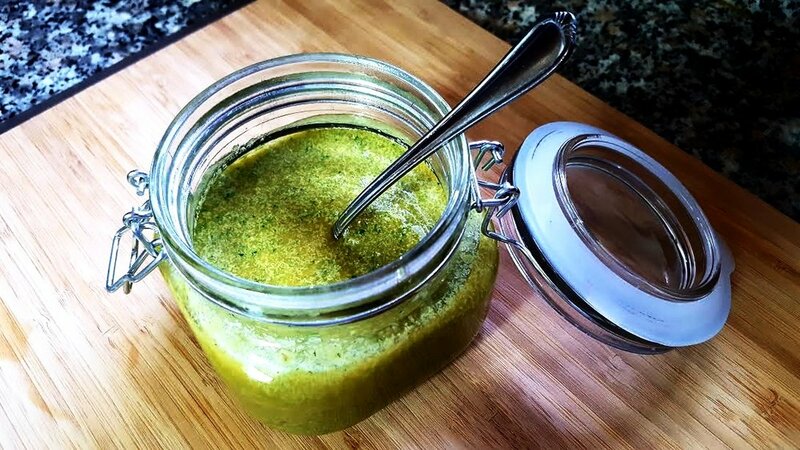 Fresh herbs make this salad dressing super tasty and antioxidant-rich! Put dressing into a wide-mouth glass storage jar or Mason jar and refrigerate for at least an hour before serving. It will keep for a week or more in your fridge. Use on salad or baste onto chicken or fish before baking or grilling! Bien comida, comida sana…good food, healthy food! Delicious and healthy! Use it on salad or use as a marinade for chicken or fish! Don’t be tempted to use much more than one clove of garlic. I’m a garlic-lover, but it will over power the dressing if you use too much! If you don’t have fresh herbs (parsley, chives, and dill), you can substitute dried herbs. Just remember that you’ll use less of the dried herbs than you do fresh. Taste your dressing as you’re making it! If the dressing is too thick, add more olive oil. If you are not sensitive to dairy, you can replace the olive oil with sour cream or Greek yogurt. Be sure to use full fat sour cream and Greek yogurt! The olive oil may separate or harden in the fridge. This is not a problem. Simply pull it out of the fridge about 20 minutes before you plan to eat so that it warms, and then shake it up or mix it with a spoon.